Head to Cici’s Pizza for Pi Day – Thursday, 3/14 for a hot deal! There are Cici’s Pizza Coupons available to save you some money!!! 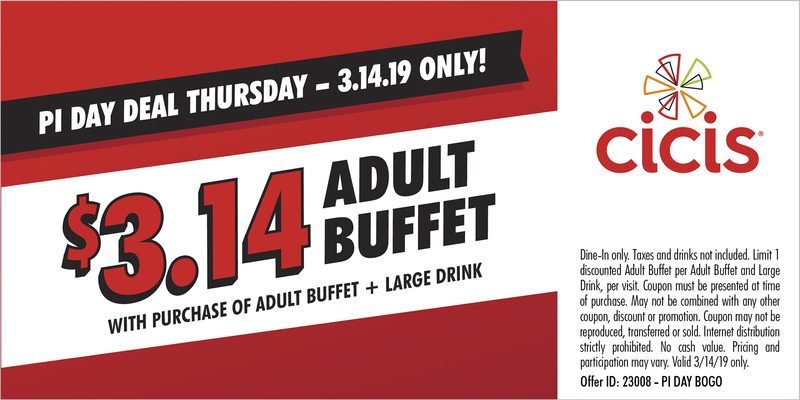 On 3/14, you can get a $3.14 Cici’s Adult Buffet when you buy 1 adult buffet and a large drink with THIS COUPON at participating locations. Deal valid for dine-in on 3/14 only. Find a Cicis location near you. Make sure to call to verify our local Cicis location is participating. Check out the Cici’s Pizza Coupons details below. Dine-in only. Taxes and drinks not included. Limit 1 discounted Adult Buffet per Adult Buffet + Large Drink, per visit. Coupon must be presented at time of purchase. May not be combined with any other coupon, discount, or promotion. No cash value. Pricing and participation may vary. Valid 3/14/19. Check out more Restaurant Deals at HotCouponWorld!